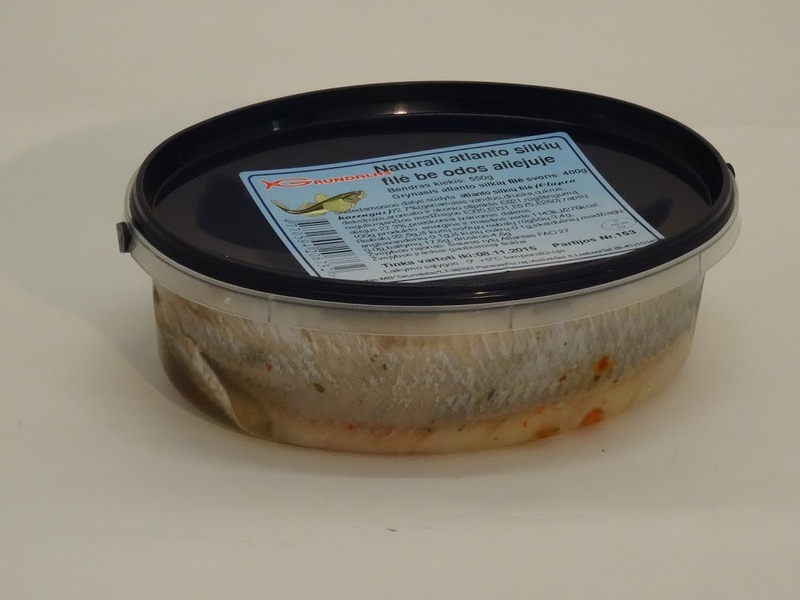 Culinary fish products: grilled, marinated fish, fish salad with sea cabbage, pickled herring salad with vegetables and mayonnaise. 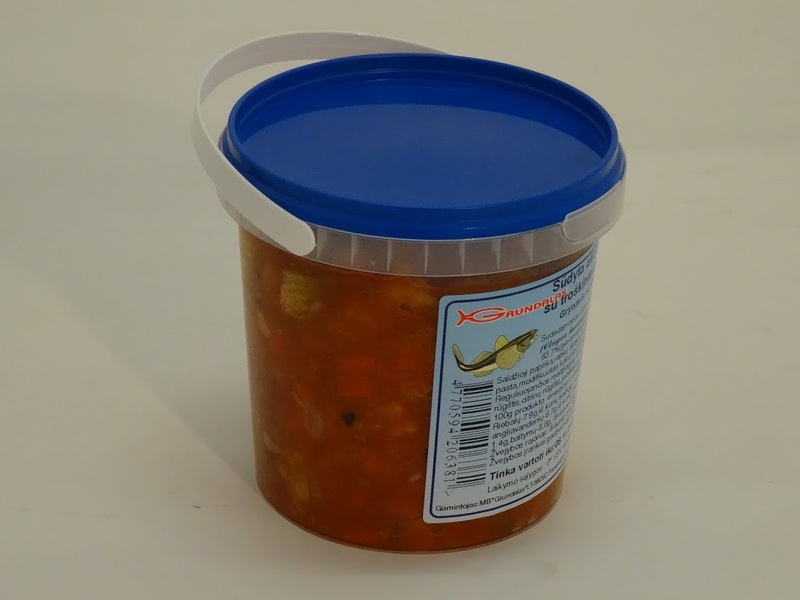 Ingredients: salted Atlantic herring fillets 36,3 %, steamed vegetables 63,7 % . 100 g energy and nutritional value of the product: 553 kJ/133 kcal. 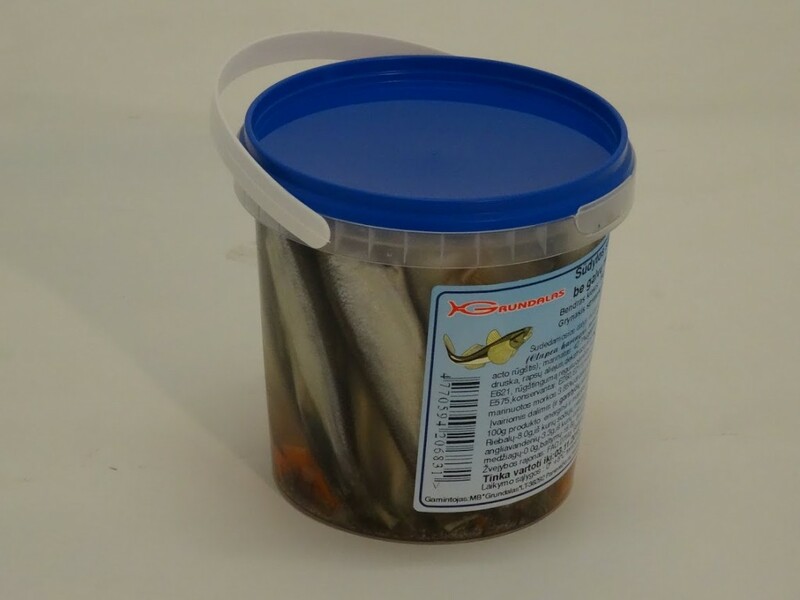 Fats 7,9 g, among them saturated fatty acids 1,2 g, carbohydrates 6,7 g, among them sugars 4,8 g, fibre 1,4 g, proteins 8,0 g, salts 3,4 g.
Ingredients: fried Baltic herrings without heads 50 %, tomato vinaigrette 50 %. 100 g energy and nutritional value of the product: 1559 kJ/298 kcal. 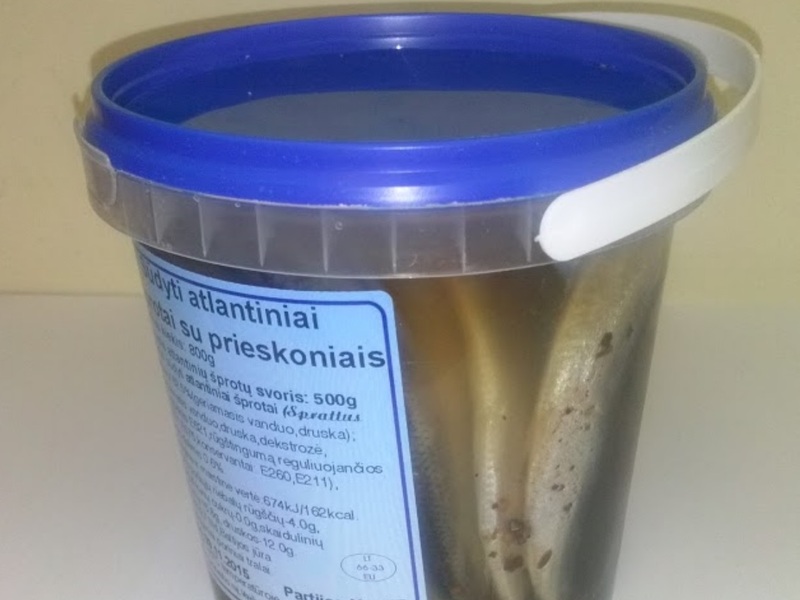 Fats 29,5 g, among them saturated fatty acids 4,3 g, carbohydrates 5,8 g, among them sugars 0,1 g, fibre 0,4 g, proteins 21,5 g, salts 2,0 g.
Ingredients: fried Baltic herrings without heads 50 %, marinade 39,8 %, marinated onions 5,1 %, marinated onions 5,1 %, species in various proportions (and mustard seeds). 100 g energy and nutritional value of the product 1331kJ/320 kcal. Fats 24,3 g, among them saturated fatty acids 3,4 g, carbohydrates 9,0 g, among them sugars 2,4 g, fibre 1,3 g, proteins 15,8 g, salts 2,0 g.
Ingredients: fried Baltic herrings without heads 62,5 %, mustard marinade 37,5 %. 100 g energy and nutritional value of the product: 1052 kJ/253 kcal. 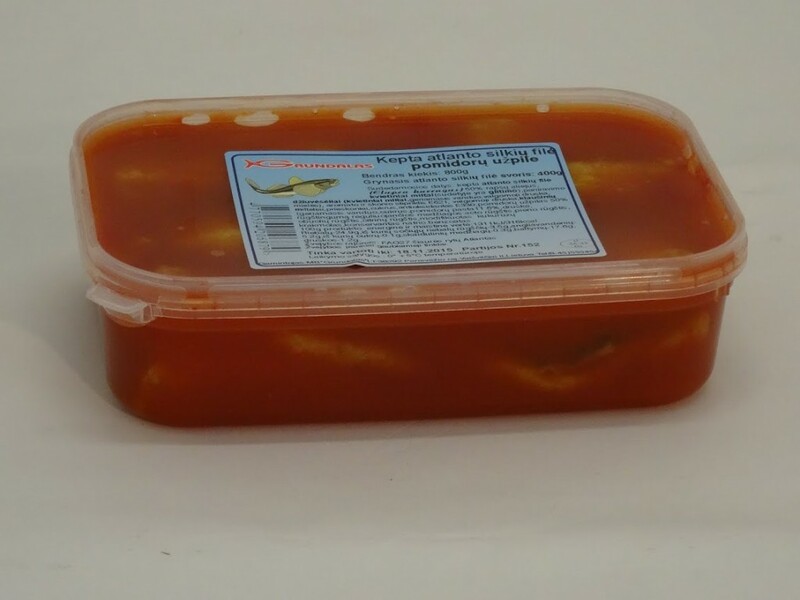 Fats 16,6 g, among them saturated fatty acids 1,8 g, carbohydrates 7,8 g, among them sugars 5,6 g, fibre 1,2 g, proteins 17,4 g, salts 1,3 g.
Ingredients: fried fillet of Atlantic herring 50 %, tomato vinaigrette 50 %. 100 g energy and nutritional value of the product: 1311 kJ/316 kcal. 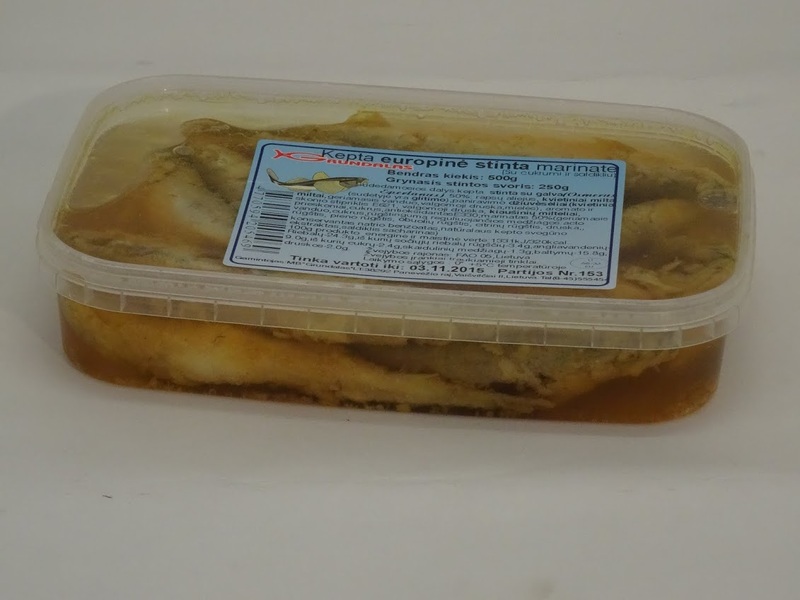 Fats 24,9 g, among them saturated fatty acids 3,5 g, carbohydrates 5,2 g, among them sugars 0,1 g, fibre 0,3 g, proteins 17,6 g, salts 1,2 g.
Ingredients: fried smelt with heads 50 %, marinade 50 %. 100 g energy and nutritional value of the product: 1331 kJ/320 kcal. 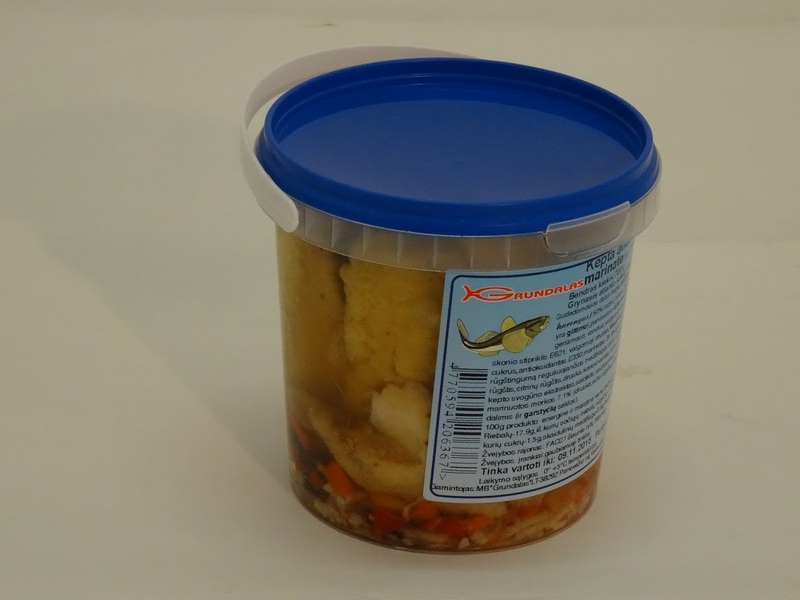 Ingredients: fried fillet of Atlantic herring 50 %, marinade 35,8 %, marinated onions 7,1 %, marinated carrots 7,1 %, species in various proportions (and mustard seeds). 100 g energy and nutritional value of the product: 942 kJ/149 kcal. Fats 17,9 g, among them saturated fatty acids 2,5 g, carbohydrates 5,4 g, among them sugars 1,5 g, fibre 0,8 g, proteins 15,5 g, salts 3,5 g.
According to the amount of salt, fish is classified into low salted (3-7 per cent), medium salted (7-10 per cent) and high salted fish (more than 10 percent). 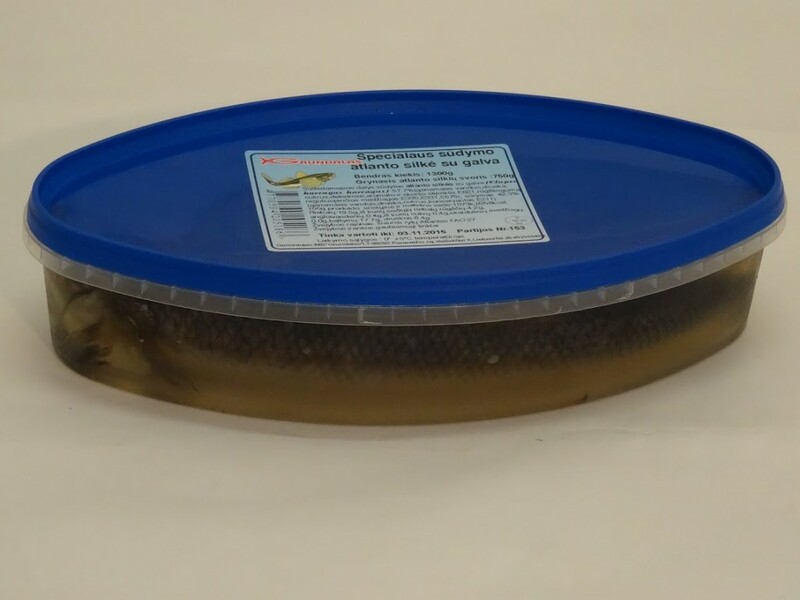 Fish salted in a qualitative way is of specific pleasant smell, it retains the colour characteristic for its type. Salted fish preserves its valuable nutritional properties. 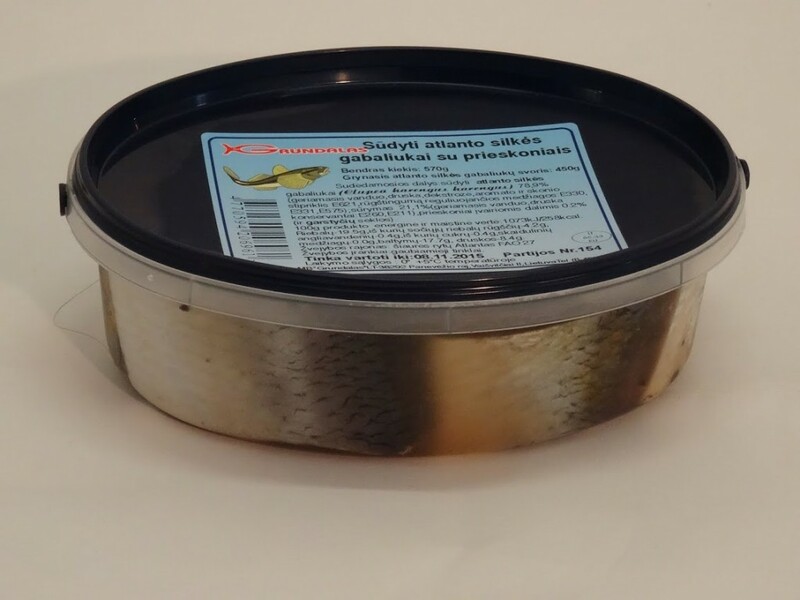 MB GRUNDALAS herring products are manufactured of herring from Norway and Iceland. 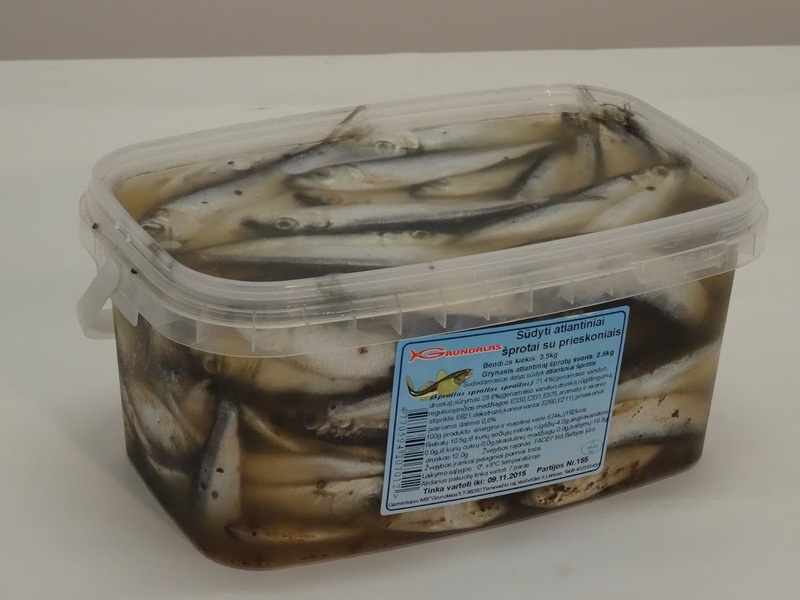 Sprat and herring are processed of fishes caught in Latvia in the Baltic Sea. 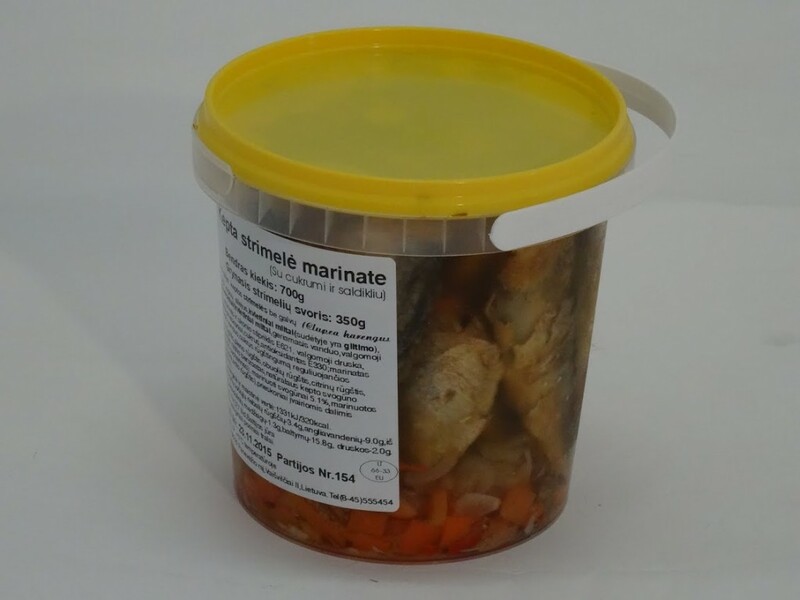 Ingredients: salted Baltic herrings without heads 50 %, marinade 42,3 %, marinated onions 3,85 %, marinated carrots 3,85 %, species in various proportions (and mustard seeds). 100 g energy and nutritional value of the product: 624 kJ/149 kcal. 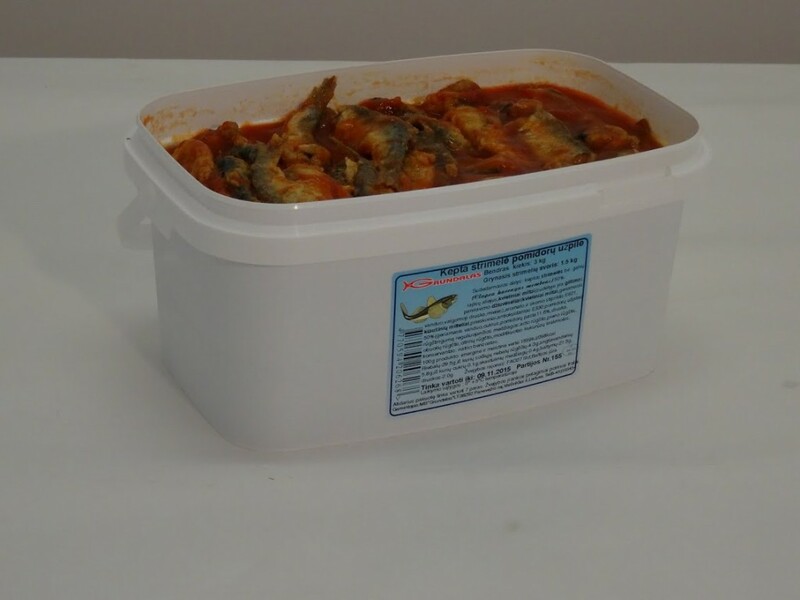 Fats 8,0 g, among them saturated fatty acids 2,0 g, carbohydrates 3,3 g, among them sugars 3,3 g, fibre 0,0 g, proteins 16,0 g, salts 5,3 g.
Ingredients: salted Atlantic sprats 62,5 %, brine 37,5 %, species in various proportions 0,6 %. 100 g energy and nutritional value of the product: 674 kJ/162 kcal. Fats 10,5 g, among them saturated fatty acids 4,0 g, carbohydrates 0,0 g, among them sugars 0,0 g, fibre 0,0 g, proteins 16,8 g, salts 12,0 g.
Ingredients: salted Atlantic sprats 71,4 %, brine 28,6 %, species in various proportions 0,6 %. 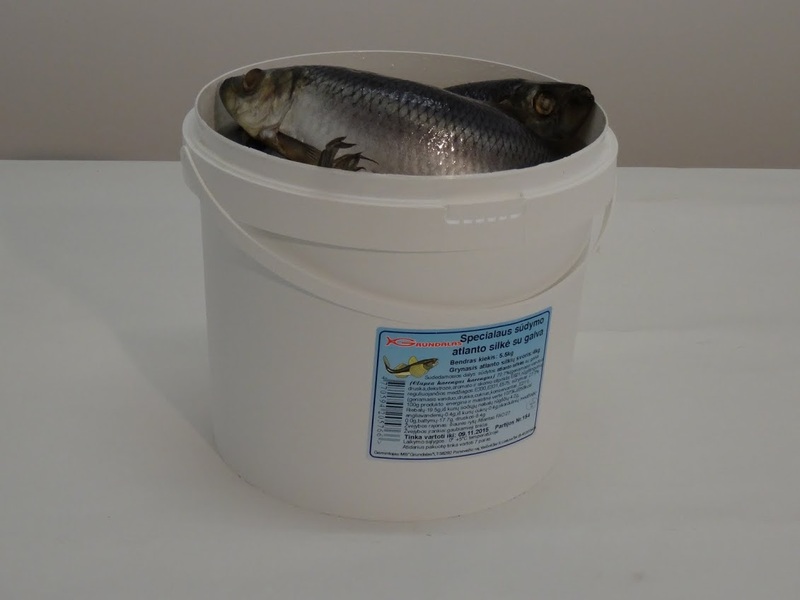 Ingredients: salted Atlantic herring headed 72,7 %, brine 27,3 %. 100 g energy and nutritional value of the product: 1073 kJ/258 kcal. Fats 19,5 g, among them saturated fatty acids 4,2 g, carbohydrates 0,4 g, among them sugars 0,4 g, fibre 0,0 g, proteins 17,7 g, salts 8,4 g.
Ingredients: salted Atlantic herring headed 57,7 %, brine 42,3 %. 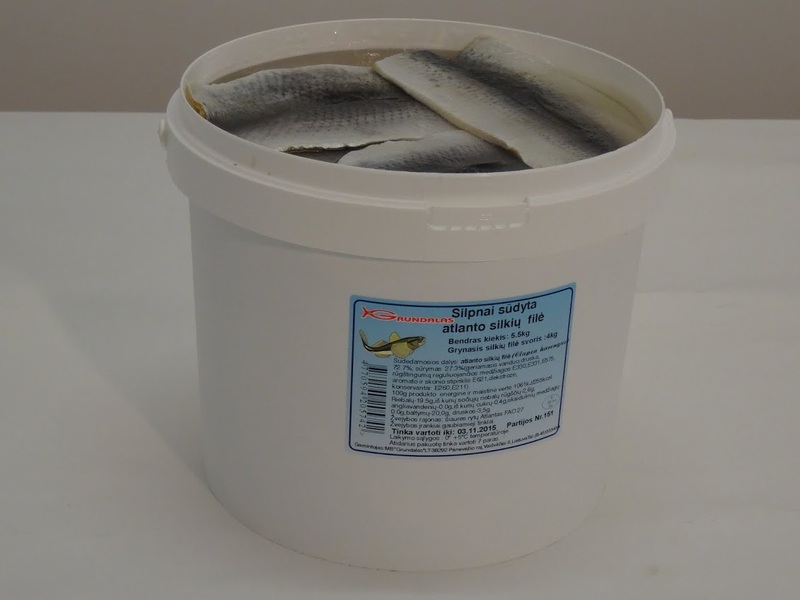 Ingredients: salted Atlantic herring fillets 72,7 %, brine 27,3 %. 100 g energy and nutritional value of the product: 1061 kJ/255 kcal. Fats 19,5 g, among them saturated fatty acids 2,6 g, carbohydrates 0,0 g, among them sugars 0,4 g, fibre 0,0 g, proteins 20 g, salts 3,5 g.
Ingredients: salted herring pieces with species 78,9 %, brine 21,1 %, species in various proportions 0,2 %. 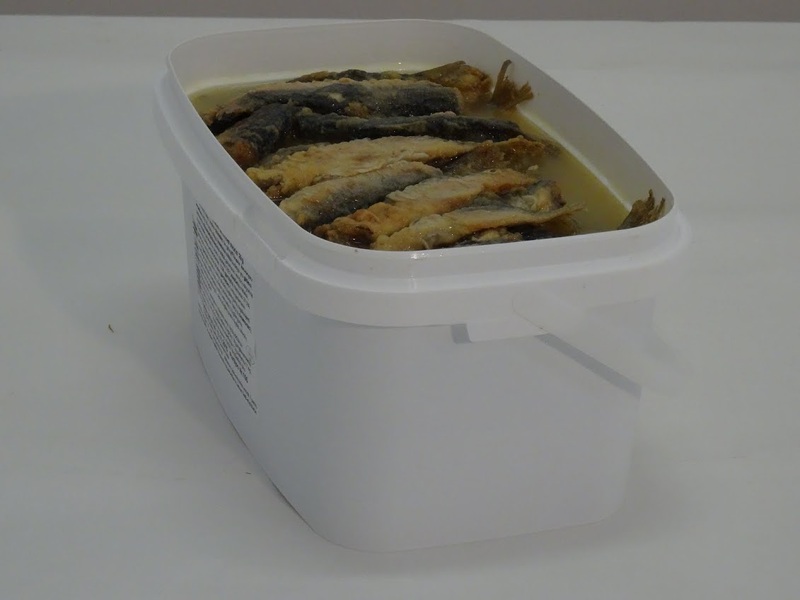 Ingredients: salted Atlantic herring fillets 72,7 %, rapeseed oil 27,3 %, species in various proportions. 100 g energy and nutritional value of the product: 1143 kJ/276 kcal. Fats 22,8 g, among them saturated fatty acids 3,4 g, carbohydrates 0,1 g, among them sugars 0,1 g, fibres 0,0 g, proteins 17,6 g, salts 4,6 g.